Java exception handling is managed via five keywords, in this article, we will use all these five keywords with examples. 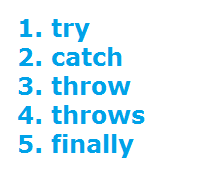 Let's to understand the basic syntax of try, catch, throw, throws and finally keywords. This diagram summaries usage of these keywords. Let's list five exception handling keywords and we will discuss each keyword with an example. Enclose the code that might throw an exception within a try block. If an exception occurs within the try block, that exception is handled by an exception handler associated with it. The try block contains at least one catch block or finally block. The try block within a try block is known as nested try block in java. Why use nested try block? Sometimes a situation may arise where a part of a block may cause one error and the entire block itself may cause another error. In such cases, exception handlers have to be nested. Java catch block is used to handle the Exception. It must be used after the try block only. You can use multiple catch block with a single try. Let's demonstrate the usage of catch block using ArithmeticException type. If you have to perform different tasks at the occurrence of different Exceptions, use java multi-catch block. In some cases, more than one exception could be raised by a single piece of code. To handle this type of situation, you can specify two or more catch clauses, each catching a different type of exception. 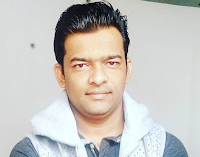 When an exception is thrown, each catch statement is inspected in order, and the first one whose type matches that of the exception is executed. After one catch statement executes, the others are bypassed, and execution continues after the try/catch block. This program will cause a division-by-zero exception if it is started with no command line arguments, since a will equal zero. It will survive the division if you provide a command-line argument, setting a to something larger than zero. But it will cause an ArrayIndexOutOfBoundsException, since the int array c has a length of 1, yet the program attempts to assign a value to c.
When you use multiple catch statements, it is important to remember that exception subclasses must come before any of their superclasses. This is because a catch statement that uses a superclass will catch exceptions of that type plus any of its subclasses. Thus, a subclass would never be reached if it came after its superclass. In Java SE 7 and later, a single catch block can handle more than one type of exception. This feature can reduce code duplication and lessen the temptation to catch an overly broad exception. Here, ThrowableInstance must be an object of type Throwable or a subclass of Throwable. Primitive types, such as int or char, as well as non-Throwable classes, such as String and Object, cannot be used as exceptions. There are two ways you can obtain a Throwable object: using a parameter in a catch clause or creating one with the new operator. The flow of execution stops immediately after the throw statement; any subsequent statements are not executed. The nearest enclosing try block is inspected to see if it has a catch statement that matches the type of exception. If it does find a match, control is transferred to that statement. If not, then the next enclosing try statement is inspected, and so on. If no matching catch is found, then the default exception handler halts the program and prints the stack trace. Here is a sample program that creates and throws an exception. The handler that catches the exception rethrows it to the outer handler. Let's create custom exception ResourceNotFoundException and use throw keyword is used to explicitly throw an exception. Note that we have used below code to demonstrate usage of throw keyword. The Java throws keyword is used to declare an exception. It gives an information to the programmer that there may occur an exception so it is better for the programmer to provide the exception handling code so that normal flow can be maintained. Exception Handling is mainly used to handle the checked exceptions. If there occurs any unchecked exception such as NullPointerException, it is programmers fault that he is not performing checkup before the code is used. We declare only checked exception using a throws keyword. Let's see an example to demonstrate the usage of a throws keyword. Basically, whenever exception arises there two cases, either you should handle the exception using try/catch or you declare the exception i.e. specifying throws with the method. Note that exceptionWithoutHandler(), exceptionWithoutHandler1() and exceptionWithoutHandler2() methods uses throws keyword to declare exception. // Read and display the file. Java finally block is a block that is used to execute important code such as closing connection, stream etc. Java finally block is always executed whether an exception is handled or not. Java finally block follows try or catch block. For each try block, there can be zero or more catch blocks, but only one finally block. The finally block will not be executed if program exits(either by calling System.exit() or by causing a fatal error that causes the process to abort). // Throw an exception out of the method. In this example, procA( ) prematurely breaks out of the try by throwing an exception. The finally clause is executed on the way out. procB( )’s try statement is exited via a return statement. The finally clause is executed before procB( ) returns. In procC( ), the try statement executes normally, without error. However, the finally block is still executed. Example 1: In this example, we have used FileInputStream to read the simple.txt file. After reading a file the resource FileInputStream should be closed by using finally block.